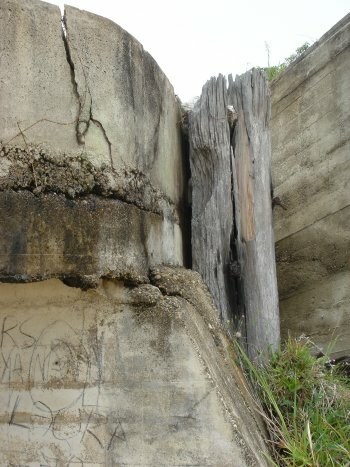 In early 1942 the Queensland Main Roads Commission was directed to erect buildings, anti-aircraft gun emplacements, command and battery observation posts, underground plotting room, magazines, accommodation for officers and men, a 20,000 gallon concrete tank, and a 20 bed hospital at Cowan Cowan (aboriginal Kau-in Kau-in) on Moreton Island. There were also instructed to build a controlled mines station with accommodation for officers and men of the Australian Navy. The former Navy Signal Station at 25 Dorothy Newnham Street, Cowan Cowan (Fort Cowan) is listed on the Heritage Register of the Brisbane City Council (ID No. 601097). Bruce Gilbert's late father joined the Australian Army in Sydney in 1936. His father wrote that "after 18 months or so, I was transferred to Brisbane, this to provide medical attention for the troops stationed at a new fort at Cowan on Moreton Island ... . This fort replaced the old one, Fort Lytton on the Brisbane River." 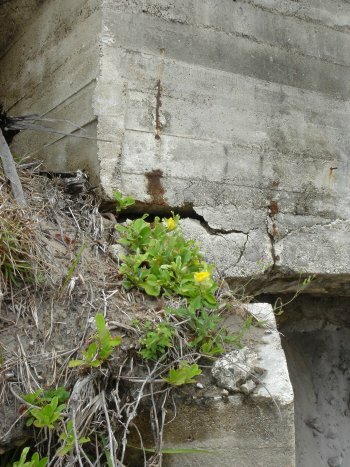 Bruce's father wrote further about the military work at Cowan, in particular the building of 2 x 6" gun emplacements and mountings, etc. 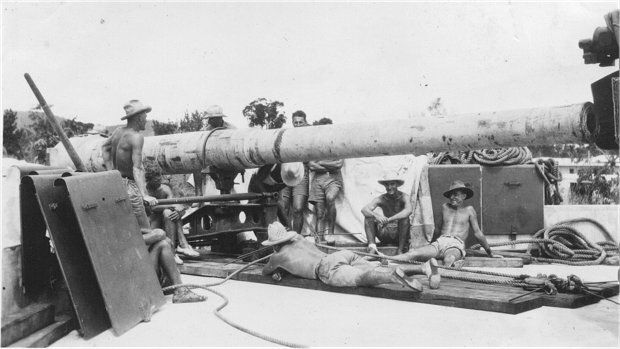 The two 6" Mark XI guns at Cowan were manned during WWII by members of the 122nd Heavy Battery Garrison Artillery, Royal Australian Artillery. The guns were dismantled in 1947. Alfred Arthur Mendham was a member of the 122nd Heavy Battery Garrison Artillery at Cowan Battery. 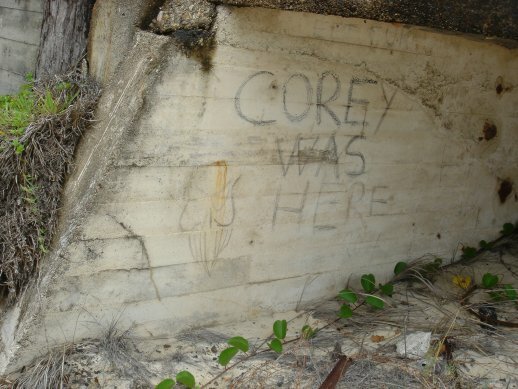 He was initially based in Brisbane with the 122nd before moving to Cowan Battery. Fort Cowan had an Observation Post on the top of Mount Tempest in the middle of the island. The two guns at Cowan Cowan were known as the Examination Battery, part of the Royal Australian Navy's Examination Service for the port of Brisbane. Bruce Gilbert's father said that the barrels were dropped at the waterline and then literally manhandled into their final resting place. Each barrel weighted about 12 ton. After his stint at Cowan, he returned to Sydney, and then joined the brand-new Darwin Mobile Force. The British mine layer "HMS Atreus" was used to lay a controlled mine field between Moreton Island and Bribie Island. The M.V. 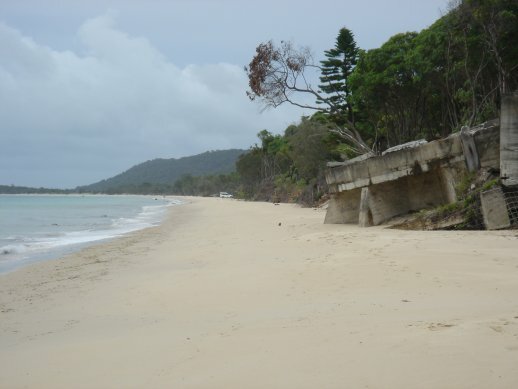 Mirimar and S.S. Lady Norman were used to transport cement, steel reinforcing and timber to Moreton Island. When the tide was right, the supplies would be offloaded onto small punts that would pull alongside the boats as they layed off in the open sea. The Main Roads Commission built some roadworks to connect the area with the older fortification on the island at Fort Rous. The road had a light pavement of concrete applied using gravel which was landed on the beach and man-handled to the job site. They later used a mixture of dune sand and cement that seemed to work OK. It was so successful that the dune sand was used to construct the 20,000 gallon concrete tank. Lt. H.N. Vidgen of the Stores Section of the First District Depot Company AAOC at Gaythorne in Brisbane took an Ordnance Detachment to Cowan Battery for two weeks to provide Ordnance support for the Artillery Battery stationed there. While this unit was at Cowan Cowan two large unidentified warships appeared on the horizon. The Battery Commander considered firing on the ships but decided to wait to see if they could be identified. They were eventually identified as two British warships. 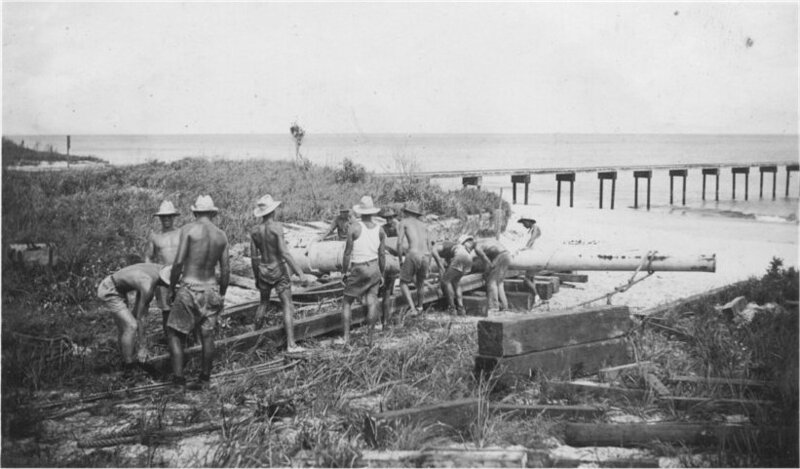 A naval station was built at Tangalooma where a jetty was constructed. A road was built across the island to the ocean beach where base end stations were established for beach patrols from a garrison located at Cape Moreton. A further Naval base was provided at Comboyuro Point. 8 miles of road was formed from Bulwer to Cape Moreton. Darrell Butcher contacted me on 14 October 2001 advising that he had owned a House at Cowan since it's construction in January 1977. He said that it was built over the underground plotting room. Darrel had copies of the original Military plan of the Village. Darrell was planning to replace the house with a new one commencing February 2001. Back in WW2 there were a couple of large guns around 6 inches or so at Cowan Cowan that were deactivated after WW2. Around 1957 or 1958 the Army decided to activate one of the guns and actually fire it. At the time the PMG Department had 2 radio telephone circuits back to Brisbane. One of the circuits went to the lighthouse at Cape Moreton whilst the other went to the Whaling Station. Shock Horror when it was discovered that they were actually going to fire the gun. It was feared that if the gun was fired the shock of firing the gun the delicate valves would pop out of their sockets or be damaged. On the day that the gun was due to be fired the PMG sent a technician to Cowan Cowan to restore the radio systems if they became inoperable. The gun was fired and the radio link equipment was not effected!!!. It would have been a very difficult job to move it and I don't know what finally happened to it. The auxiliary minesweeper HMAS " Tambar" (j.171), commanded by Lt. J. H. P. DIXON, RANR, was based in Brisbane as part of Minesweeping Group 74 ("Kianga" and the "Tambar") from 1939. 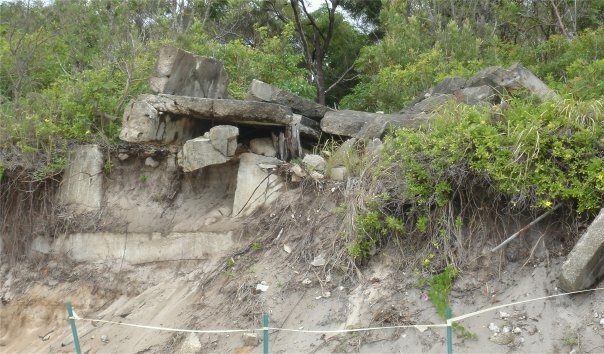 During a routine patrol in Moreton Bay on 4th of March 1942, the "Tambar" was involved in an unfortunate incident with the Examination Battery at Cowan Cowan on Moreton Island. 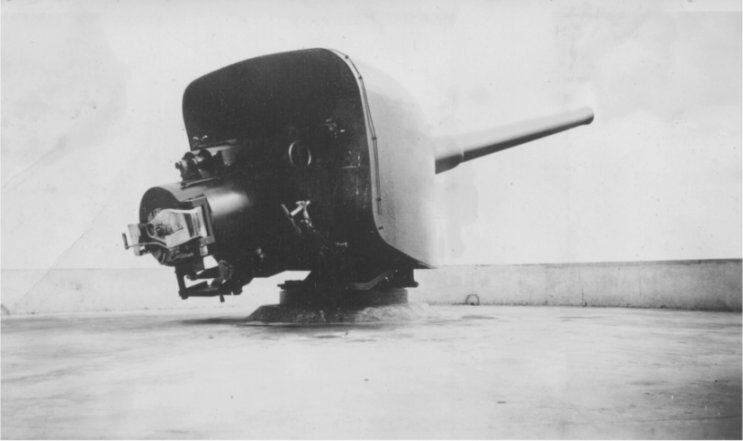 Following a mix up of code signals, one of the 6 inch guns at the Examination Battery( Lt.E.Bingham, RAA) was ordered to fire a bring to shot across the "Tambar's" bow. However the shell struck the ships forecastle, where it killed Able Seaman A. E. Bartch of the anchor party instantly, the shell then skidded across the deck, struck the superstructure, passed through the captain's cabin, killed Steward E. R. Harrison instantly, then passed through the radio room, severed both legs of Warrant Officer H. Theeman before leaving the ship and plunging into the sea. WO Theeman was to later die in Greenslopes Hospital as a result of his wounds. At that time during the war it was felt by the authorities that the incident would be bad for morale and to aid secrecy the "Tambar's" crew was dispersed throughout the RAN immediately after the funeral of their shipmates. The captain was given a new command and the "Tambar" was later paid off as a minesweeper. She did see later war service as a boom defence vessel. Fort "xxxx" was the terminology used for coast defence facilities pre WWII, and they were manned by numbered Heavy Batteries. In the case of Brisbane, 8 Heavy Battery was the permanent army unit and 122 Heavy Battery was the militia unit. A mixed crew from these units were to man Fort Lytton and Fort Cowan. 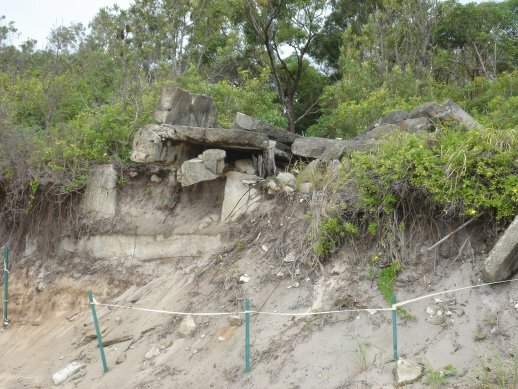 Construction started on Fort Bribie in early 1940. Also at each site were land defences which were manned by men from "C" Coy of 1 Garrison Battalion. 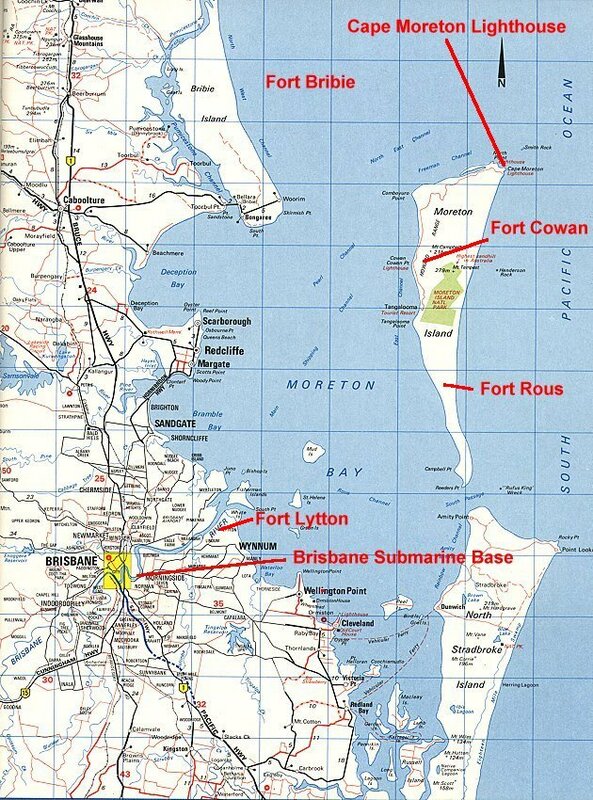 Fort Cowan and Fort Bribie were convenient labels to apply to the whole complex. 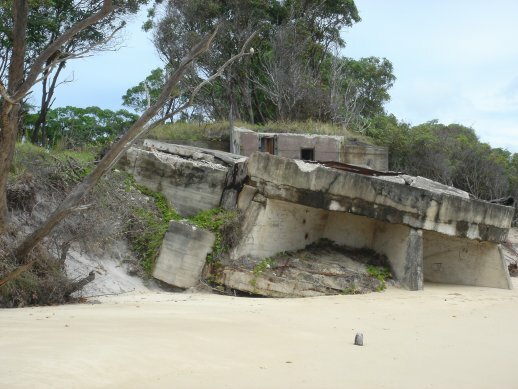 In October 1940, the coast artillery was reorganized so the regulars and militiamen at Cowan were merged to become Cowan Battery and when the guns at Bribie were finally operational, the manning unit, and the guns became Bribie Battery. The later batteries (Rous & Skirmish) were formed after this change so were never called Forts officially, but the name was sometimes used. Militia At this time 1 had joined the militia, service in the First Anti‑Aircraft Battery (1AA) at Mosman, the only one in Australia. I also joined the long waiting list for the Garrison Artillery, Australia's largest permanent military force. PMF 1936 In the meantime I heard of a vacancy in the (Australian Army Medical Corps) A.A.M.C. in the permanent forces. I was selected out of about 15 applicants and commenced service on the second July, 1936, being enlisted at Georges Heights, Mosman. I was stationed at Victoria Barracks, duties being helping in the Dental Clinic and at the daily sick parades, (mainly football injuries). I used to go into camps, (mainly at Liverpool and Holsworthy) and set up an R.A.P. and camp hospital for the varied and many militia units doing their annual training camps. PMF � BRISBANE After 18 months or so I was transferred to Brisbane, this to provide medical attention for the troops stationed at a new fort at Cowan on Moreton Island, some miles off the coast and to the north of Stradbroke Island. This new fort replaced the old one, Fort Lytton on the Brisbane River. It was placed to guard the shipping lanes and approaches in Moreton Bay for protection of Brisbane. Food and other living conditions were fairly rough as with many other situations just following the great depression. However, the actual situation of the island was attractive. With swimming and fishing, (this latter often needed for fresh food). Our supplies came down from Brisbane once a week in a chartered 45 ft. launch, the Maringo. Sometimes the crossing was too rough and our supplies were very late. Moreton Island, largest known sand hills in the world, Mount Tempest just over 1000 ft. There was no power, only fresh food for a couple of days each week. 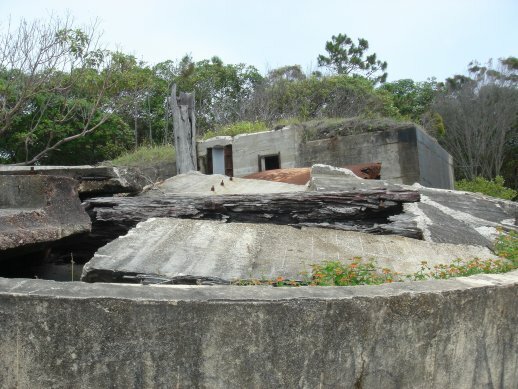 The various buildings, two 6" gun emplacements & mountings, two searchlights with engine room and generators and a jetty were built by contractors. With poor hygiene that left us a plague of fleas, millions, we had to take extensive measures to deal with them. The two gun barrels, about 12 tons each were brought down by barge and dropped in shallow water. They were dragged in by hand winch and man‑handled on wooden bearers by levers and rollers, etc, up the beach and into the gun mountings, cleaned, and tested by proof firings. With about 12 men doing the actual work, this worked to about a ton per man. The guns were fired at a towed target when militia artillery unit came down for their annual camp. Our only close neighbours were the lighthouse keeper, Jim Crane, and his family. Part of his duties was the notifying by phone to Brisbane each incoming ship, getting their name by telescope and at night by Morse lamp. Every afternoon he would cycle along the beach and climb up a hill to clean and service the oil light there. (Bulwer Light). There were two manned lighthouses on the northern part of the island. All shipping had to be piloted in and out, (there was a narrow and dog‑leg course across Moreton Bay), by two pilot ships, the "John Oxley" and the "Matthew Flinders", the former is now in Sydney's Maritime Museum. In fine weather, Moreton Bay was attractive, especially with the first rays of the sun striking the Glass House Mountains, opposite on the mainland, (they were named by Captain Cook). We would get a week's leave every month or two in Brisbane, not a very exciting place for a stranger. During this period, I learned of a vacancy for a promotion to Corporal. With no practical knowledge of squad and stretcher drill, etc, and no squad to drill, I was battling. One of my old soldier friends said "Don't worry. Just drill a tree, detail and make it go through the various movements". That's what I did, with no‑one near my little cottage hospital, I studied all my books by hurricane lamp at night and drilled the tree next day! Later on, when some militia units came down for their firing practice, they had a small medical unit attached, so, presto‑my living, breathing squad of real live soldiers. Under the eyes of the Colonel and the Sergeant‑Major, I put them through the whole lot. The result; congratulations, a special pass in General Orders and promotion to Corporal, my first real step up. I joined the AIF at the Exhibition Grounds on 20th January 1942, the next day went to Redbank and was issued with a worn out Rifle, Boer War bayonet and 10 rounds of ammo, I did a route march to Goodna and back, bit of bayonet drill, had my arms pumped with needles, then on the 27th January away to the war I went by convoy to Bribie Island. North of Brisbane the officer in charge was one Lt Bill Wade who stopped the convoy and announced to all:- " Debus and wee wee", from then on affectionately known as "WEE WEE WILLIE WADE" At this stage we had yet to fire a shot out of our old rifles, to my disgust. I found I was posted to a unit known as the 14th Garrison Battalion, (The other part of the 14th Garrison Btn. were posted to Cowan Cowan) we were there to guard the Forts?? and were stationed about half a mile south of the Forts. With Tee tree logs we built some dugouts into the sand dunes, Not only were the Mossies and Sandflies very friendly but we found that sand fleas also had a liking for human flesh. We had a couple of impressed 3 ton International trucks and with these we pushed through a track to Skirmish Point south of Woorim where we had a section stationed that would spend 10 days there to guard that portion of Bribie???? Our unit with those at Cowan left Bribie about the end of May and headed north to Cairns where we spent about 6 weeks then on to TI where we then became the 62nd Battalion, at the end of the year an advance company of that Battalion then moved on to Merauke which was then Dutch New Guinea. 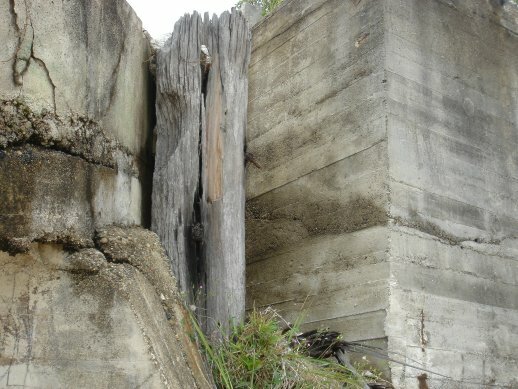 about the Fortifications at Cowan Cowan? Part of the Royal Navy's anti-submarine harbour defence for "Fortress Brisbane"
"The History of the Queensland Main Roads Commission during World War II (1939-1945)"
I'd like to thank Graham McKenzie-Smith, Bruce Gilbert, Lionel Sharp, Lee Deighton, Darrell Butcher and Craig Steffens for their assistance with this home page.